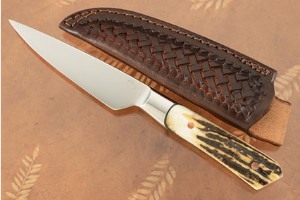 Description: Bill Burke, who was honored as a Mastersmith in June 2008, is known for creating some of the best and highest performance knives that can be found anywhere. His heat treatment technique, combined with his choice of steel, results in edge holding that is far beyond other knives. Bill's work is truly exceptional, as is demonstrated in this Don Fogg-inspired integral utility. An integral knife -- meaning one which has one solid piece of steel from tip, to bolster and to the pommel -- is much harder to forge and grind than a standard pinned knife. It is much more technically demanding and time consuming but it is knifemaking at its finest. This exceptional utility knife will feel at home out in the field, as a paring knife in the kitchen, or as a cherished knife in a collection. It is the perfect length for detail-oriented tasks, from removing the tops from strawberries and tomatoes to the eyes from potatoes. This 4-1/2 inch utility knife was pre-tested for edge flex and cutting ability before assembly. A particularly small grain structure is created by a heat treatment process incorporating low temperature forging, a triple quench, and a triple temper. 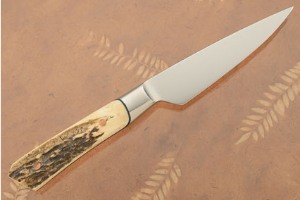 Bill used 52100 carbon steel to create this knife. Many knifemakers and users feel that 52100 is among the highest performing steels using in the knife industry. 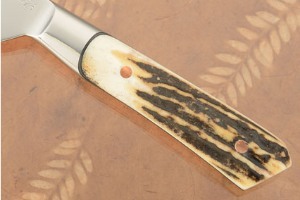 The handle is formed from sculpted stag antler. 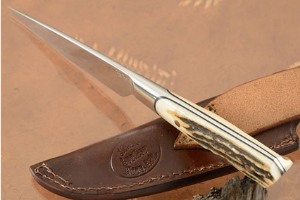 The handle scales are carved to nestle in the hand, with full tang construction for strength and durability. The stag set with copper pins that are carved to match the natural texture of the stag. A perfect balance makes this little utility knife a joy to use.